What can you do to ensure that most of the year round when you have a busy, successful pub, cafe or restaurant with a large outdoor garden and courtyard area the customers can enjoy being outside even if mother nature decides to throw some rain down but the temperature is still pleasant? A system that will also take the heat out of the very hottest days and protect from intense sunlight during midday but allow pleasant spring and Autumn sunshine to flood down with the roof retracted. Easy! Take a look at one of the Samson Awnings retractable fabric roof systems by either Gibus, Markilux or Weinor. in the large walled garden area. 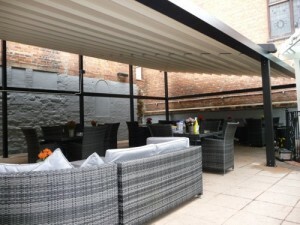 The recently installed Gibus system we have installed will allow a tough vinyl coated fabric roof system to extend in 2 seperate controlled sections whenever the weather may decide to turn slightly allowing everybody to continue eating and drinking outdoors whilst underneath a very capable roof structure also designed to take snow loadings if required! This picture shows the roof system fully closed but not quite finished yet with lighting, tv screens and further enhancements to complete a perfect outdoor area for customers. Constant replacement of inadequate umbrellas and pop up tent type contraptions can never be relied upon to deal with the UK weather properly and also have great issues in any kind of wind. The retractable roof systems supplied by Samson Awnings have been specifically developed over years to deal with sun, wind, rain and snow with built in guttering as well to effectively disperse rainwater. The convenience of being able to half open or fully open simply at the push of a button allows customer to have the full benefit of various weather conditions but the assurance that is it suddenly turns a but nasty they can rely upon what can only be compared to a plastered white ceiling appearing over their heads. If you are ever in Northampton or passing call into the Wig and Pen, St Giles Street, Northampton. Not only will you get great food and a choice of excellent beers and ales you will also we the future of al fresco entertainment and dining.